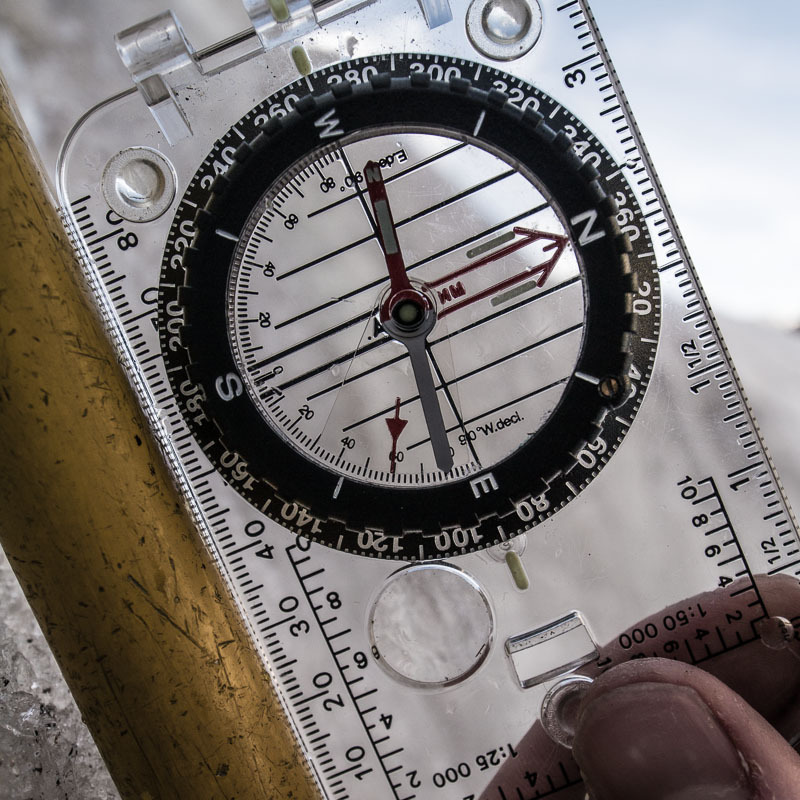 For years I have heard stories about the French and Swiss Alpine guides entrance exams which involves a ‘parcours de glace’, or a timed circuit ascending and descending icy terrain. The most engaging part seemed to be the necessity to descend >40° ice facing out. To me that always seemed both dangerous and unnecessary! Misha Gopaul practicing ‘piolet ramasse’ technique on the Mer de Glace, Chamonix, France. Why not just face inwards with the comfort of ones weight spread into the slope between axes and crampons? This seems stable enough. Nevertheless my friend Misha Gopaul has applied to join the Swiss IFMGA guides scheme and has taken some instruction from a Swiss qualified, South African guide (Andrew Lanham) in several aspects of the entrance test, including this. This week Misha is somewhere in the mountains above Grindelwald taking this three day test. 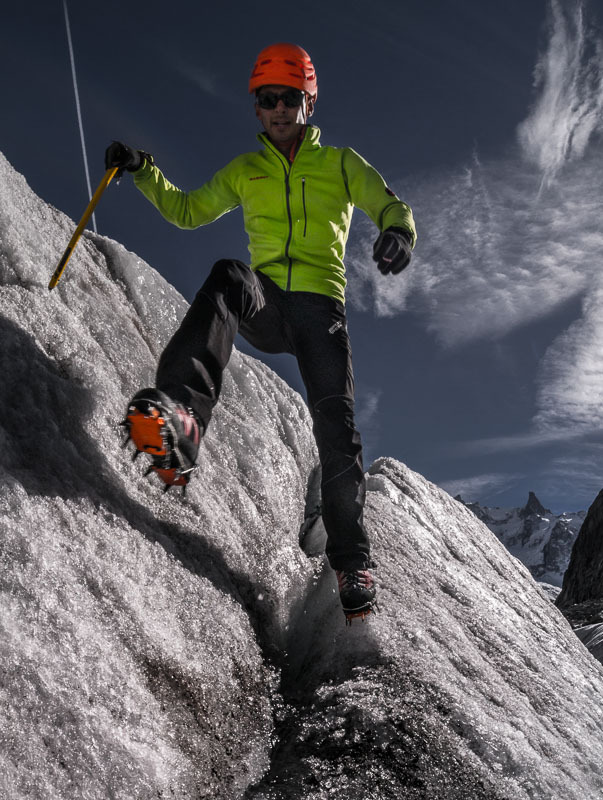 In the last week besides some ski training from the Aiguille du Midi and over at Zermatt we spent a day on the Mer de Glace working on the skills Andy had highlighted, in particular ‘piolet ramasse’. 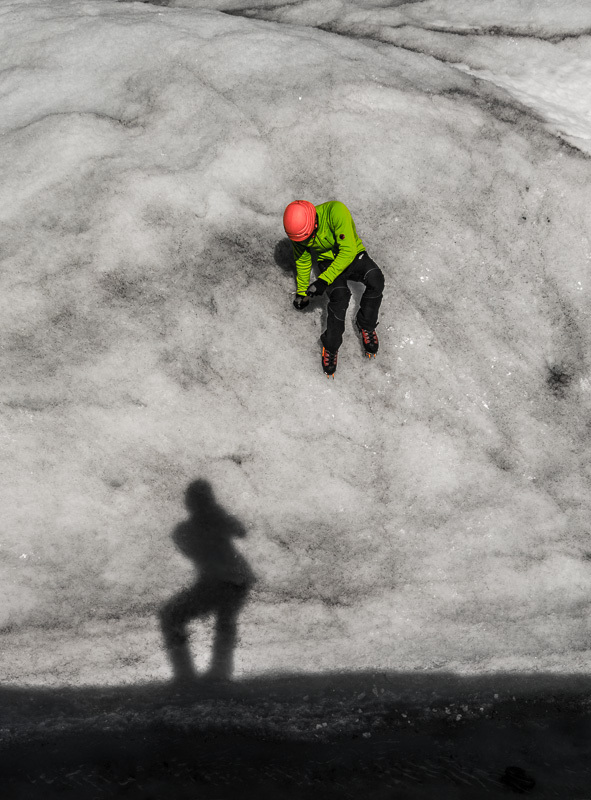 From the verb ‘ramasser’, to pick up of gather, this is a technique used to descend ice slopes 40-60° facing out. We spent many hours workshopping the technique, using a top rope to develop confidence, then trying steeper slopes without the rope. Having both started at a point of being uncomfortable but able to descend 40° facing out, by the time the sun dipped behind the Grepon we had both managed to descend a slope of 60° facing out. To me this seemed like a revolution and exceeded my expectations. Though in and of itself it may not be that often employed, training in the technique has allowed me to move much more swiftly in descent on more moderate slopes with confidence and control. 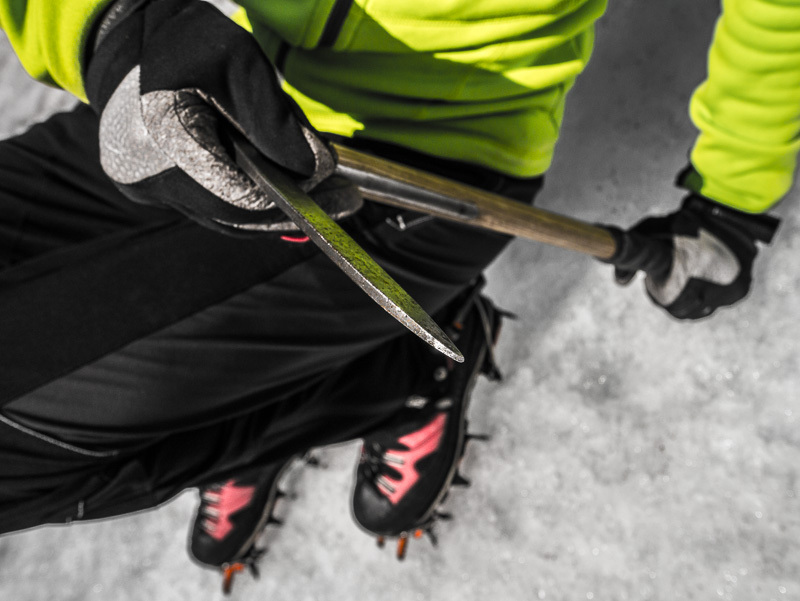 The technique does require an axe with a decent spike, so with a modern steep ice tool it may not be possible. An old school mountaineering or walking axe is perfect. In fact for the Swiss test they are obliged to use a bizarre weapon called a ‘Piolet de taille’ (pictured above). It has a straight horizontal pick with no teeth and wooden shaft terminating in a very aggressive long sharp spike. Progression up steep ice is somewhat complicated, usually involving carving handholds and steps, but for descending the long spike provides incomparable purchase in the ice. The technique is actually quite simple, but requires practice to build confidence. With the pick facing away from the body the spike is rammed into the ice perpendicular to the slope. Your weight is then applied to the axe with one hand near the spike, and the other controlling the head. The crampons are placed firmly with flat feet toes facing the fall line. Starting with the axe at hip height, close to the body, balance is shifted over the axe so the feet can be moved down slope. When the feet are stable, and this is the crux of confidence, the balance is shifted towards the crampons and the axe is removed and replaced as before but lower. As one builds confidence it can become a fluid movement as the feet scuttle down, axe removed and replaced, all the while shifting the centre of gravity back and forth between feet and hips. ..and the inclinometer reads… 59°! What I found most remarkable about the technique is that with a bit of practice it is quicker and feels more stable than facing inwards on moderately steep ice. 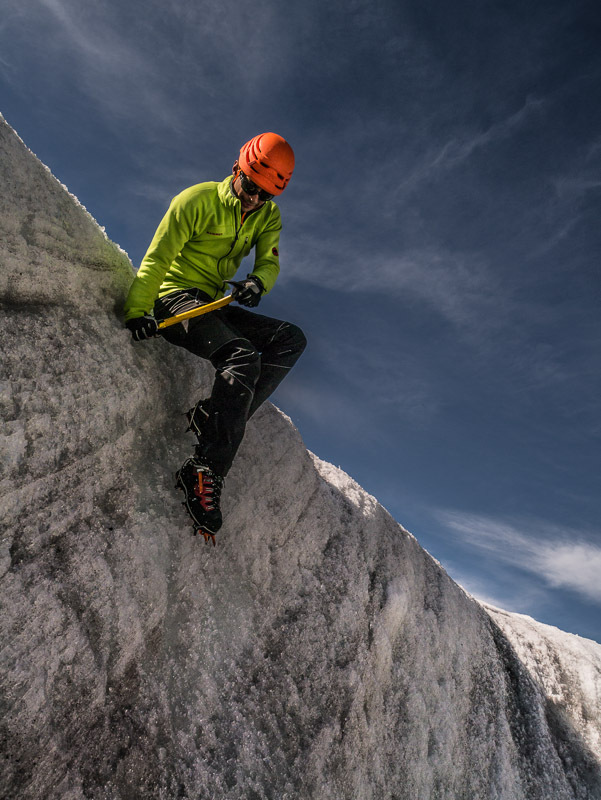 If either the axe or the crampons slip, with the centre of gravity between them the position is auto stabilising. As much of one’s body weight can be centred over the axe, which is controlled firmly in two hands, a slip is quickly arrested. By contrast facing inwards firstly one can’t see the terrain ahead so progress on ice is often more tentative. Furthermore at speed, as only one hand is usually on the axe a slip usually requires one to quickly lunge to control the axe with both hands and arrest the fall. Misha practicing the ‘parcours’, moving rapidly on easier terrain. The technique does require practice, and I would recommend using a short step of ice to practice on, rather than a sustained slope. Starting out on easier angle slopes, then using a rope to progress onto steeper slopes worked for us. Obviously this is a subtle art, not to be deployed in committing terrain until one has mastered the techniques. This description is not meant to be an instruction manual, so please get a professional to show you the technique in a controlled environment!